Premium audits are one of the most misunderstood parts of the Workers Compensation insurance cycle. Agents and Risk Managers now need to become more involved in Premium Audits as a customer service advantage over the competition. The session will cover the most confusing Classification Codes. Subcontractors and certificates of insurance as they apply to premium audits will be covered in detail. 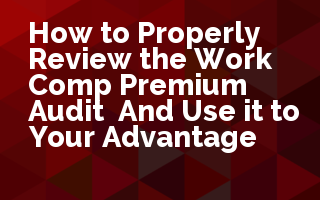 Examples of real-world premium audit reviews will be included to show the most common questions or errors with premium audits. A list of the most common premium audit terms will be provided for future reference.